I’m sorry I haven’t posted. I’m daunted by the task, and can’t give you as much as I’d like, for all of the expected reasons: Increased pain and shortness of breath, weakness and shakiness (?). Forgive typos. Last Sunday, Fr John was here. He had come to give me Communion, and we were talking afterward when a string of other parishioners arrived. Dr Bob had brought twenty to carole me from the other side of the mountain. I managed to mostly keep it together; Christopher was not. He has been very moved by the actions of Holy Trinity and her clergy. I hope and pray that after Christ takes me, he and the church will continue to heal one another. Oh you heard something about the nor’easter that hit. Boy, did it, but not as bad as they’d predicted. Weather report said sleet and freezing rain every day, and we tunred out to ave only one of those, thank God. If our roles were reversed, this would be hell for me, as scared of heights as I am. Christmas Day began very bad, Christmas here, and all. Christopher arrived in his Santa cap when Sharon, Brook, and Stacy, three nurses aides, were here and I was recovering from a particularly excrutiation pain spam. Sharon was crying as she took my hand and said this was going to be the best Christmas ever because I was surrounded by people who loved me. That’s when I started crying, when I realized the truth of what she said, and we had a room of ten wet eyes. Everything was uphill after that. Christopher is on I-99 now, but they canceled my brother’s flight. April is on her way. With that I log off for a while. My meds are making me very groggy. This entry was posted on Saturday, December 26th, 2009 at 10:47 AM and is filed under Cancer. You can follow any responses to this entry through the RSS 2.0 feed. You can leave a response, or trackback from your own site. I’m glad you were able to share Christmas with people you love and who love you. Have a terrific holiday! Dad, I’m sorry I couldn’t be there for you yesterday or today considering it is my birthday. And it appears that I will not be able to come up on the 4th. I should however be there on the 11th for sure! I will let you know for sure. Tell Brook to that I said to take good care of you for me! I’m glad you were able to spend Christmas in the company of love. I’m praying for you. Dude, no apologies required. God bless you. I’m so happy to hear you have had a company-filled Christmas. I hope some Christmas treats tempted your appetite. Unfortunately, I’m stuck in Japan this year with no trip home. Glad April is able to make another trip out. And carollers–wow! Ni,hon. Sorry I cannot be there. I was admitted to Blmgtn. Hospital Christmas Eve. Still here, trying to figure oout how to use a laptop w. one hand while at an oblique angle. Hope to be home tomorrow latest, where I can really type. It is wonderful what your church friends did. As for me, my sponsor’s intended read me the nativity story. Many visited, and also took care of Susie. I hope still to see you. I know that it may not be meant to be, tho. The weather here is cold again, and I keep thinking of last winter, and how you made me a hockey fan. It is a very good memory. Talked to April a long time last night. Wish I could have come with, but I had no business being anywhere but here. Please, someone let me know April arrived safely. Glad you were surrounded by your loved ones Prof and glad for the update. April did indeed arrive safely and so, after delays,did The Professor’s brother Jan. Lisa, I hope you can recuperate swiftly and don’t worry about not being here in the flesh. It is indeed the best of all Christmases because every minute of it feels precious. This is not one of those years with a temptation to slide into routine old habits or take the holiday season for granted. We are spending it together and it is the last one, and we are not letting it slip through our fingers, we are savoring it,the way wise people should savor every day that they are granted. And as far as the winter storms go, I’ve very nervous when the pavement is slick; but I’ve driven it so many times now that the steepness of the precipice on the other side of the guard rails no longer alarms me. Besides, when the fog is really thick, like it was last night as I drove home, you can’t see it! Note to flatlanders from the plains states – there is something almost exhilarating about mountain driving on foggy days, when you sometimes emerge as you’re climbing a ridge out of the TOP of a cloud that is clinging wetly to the lower slopes. When this happens in the daytime, it is a wonder to see the valleys of central Pennsylvania spread out beneath you, half shrouded in mist. This is beautiful country. Despite all that has happened to us here I am glad the Professor and I have had a chance to live here for awhile, and see it in the changing seasons. I too am glad you had your loved ones with you. Best wishes from a snowy (but not by US standards) Scotland. Xopher, thanks for letting me know about April and Jan. I’m home from the hospital now, but weak and lying down a lot. I don’t have an Internet connection via anything but the desktop, so more when I’m sitting up. Love you guys so very much. Xopher: Is he at all well enough to ever go outside? After reading what you wrote, I can’t help but think a scenic drive might lift his spirits some. I’ve wondered the same thing–whether there’s a chair van and whether he can use one. Avoiding the mountain views you wrote so beautifully about, of course. Mr. B. and I share an inability to wax rapturous on emerging fom a cloudtop, methinks. More soon. Much love. The Professor has not felt up to more than about a half hour out of bed, for several days in a row now, but there are some adjustments being made now to his meds, and we’ll bear these ideas in mind. I wish it were not so perishingly cold outdoors! Father Stephen, the Orthodox chaplain who recently enlisted with the hospice service, visited the Professor today and anointed him with healing oil. Good to hear of the father’s visit yesterday. I’m sure that was so good on so many counts for our guy. I will continue to hold good thoughts that he will be able to enjoy being out of the bed for longer periods and to go outdoors again. And I hear you about the cold! Yikes! Happy New Year, prof! I hope it’s a happy, safe, and most importantly, healthy one for you. Best wishes on the New Year. You remain in my prayers. The Professor has eaten little in recent days and is very weak. Father John visited last night and prayed with him, ad one of the staff members bought him a more comfortable pillow…with her own money. she refused to be reimbursed. His witness continues. Our friend April is at home, caring for the dogs, so I can be here at Valle View, today. Thank you for that update, Christopher. Still praying from far away, checking in here daily. In Christ. I hope that he is reasonably comfortable at least. I’m sure he appreciates your being there for him! Hope you are holding up as well! Thanks for the update and praying for the professor also. Xopher – Thank you for the update. Prayers being sent from Philly. Please give him my best and keep us aprised of his condition. Thanks. The extreme weather this weekend made driving very hazardous around Altoona and The Professor and I would like to ask you good folks out there to spare a kind thought and a prayer for Ernie, the husband of one of RWP’s caregivers, who was injured in a single-vehicle accident on the ice. Details were still sketchy when I left Valley View but I heard he needed 20 stitches. This couple already has a seriously ill child; they need grace to intervene and keep both parents healthy and strong to care for their youngster. Prayers being sent. I hope Ernie recovers quickly. I send a prayer for Ernie and family as well. And bless the lady who bought Clay a new pillow. I’m sorry he is so weak now, hon. I hope that at least they can keep his pain levels down. Good he is lucid enough to pray w. the father, though. Glad April is still there, taking good care of Dolly and Minnie so you can remain at Valley View. That’s important. Send her my love. I’m so sorry to have not written for a few days. I did go out for awhile on the 31st, which turns out to be something I wasn’t ready for, so have been back in bed and off-line the last couple of days. But you are never far from my thoughts. If there is anything either of you would like from me beyond my thoughts and prayers, name it, and I’ll do it if I can. Lots of prayers continue to go up on your behalf as well as for those in the accident. And also, a belated Merry Christmas and New Year. Still praying here on the other side of Altoona. I hope that the meds are able to be adjusted. The Professor lived through the night, myself and an Orthodox priest by his side. His body is strong. Please pray for all who face trouble and pain, and thank you for your prayers for the Professor. Praying for the Prof. May he be well. Prayers from here as well. Prayers being sent! Please keep us updated, Xopher! Keeping good thoughts for you both everyday. Sending you hugs of warmth and peace. Please let the Professor know that his brothers and sisters, both Catholic and Orthodox, at the Byzantine Forum have him in their prayers. 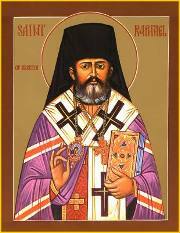 The same is true of his Orthodox and Catholic brethren at the OrthodoxChristianity.net forum. You’re a good man, Prof.
May God bless you and yours, and give you all the strength you need. Father Stephen has just visited The Professor. He is resting fairly comfortably today so far. Both his brother Jan and I are with him, and some of his favorite caregivers come on duty this shift. Glad to see he had a good day :). Thinking about you all. I’m glad Jan is there…e-spoke with Phyllis since I don’t know if texts are getting through. Warm hugs to you all. Good to hear that today is a better day. Keeping him in my prayers. his gallant witness through this entire ordeal. were holding his hands at the moment of death. Xopher, I am so very sorry for your loss. Clay was a terrific person and a wonderful friend. While devastated by the news, I am happy in the fact that he is with God. I didn’t know him personally…only as a commenter on his other blog, but I am still deeply saddened by his loss. I will miss him. I also do not know his family and friends, but I would like to express my deepest sympathy to them. May the Prof rest in peace. Clay is at peace. He showed such incredible grace throughout. I’m so sorry for your pain, Christopher; my thoughts and best wishes are with you. Sometime during the night last night, I was jolted awake by the sound of an old-fashioned jangly ring of a dial phone. Just one. Sat me straight up in bed. None of my phones ring like that. I’d like to think it was Clay, one last time, hanging up before I could get to the phone and not leaving a message on the machine. He hated that I never answered my phone. I’ll miss him. We never met. I knew him only through his blog. Yet I feel a need to say how much I’ll miss the Right Wing Prof. Rest in peace, good and faithful servant. Xopher: I also only know him through his blog, and have missed his Right Wing Nation threads on statistics, food, pets, and politics. His (and your)comments here have given me a better perspective on life, which I sorely needed. I am glad he passed peacefully, surrounded by the people who love him. God bless you for being there for him, and sharing his burden! I’ve already written to you privately, Chris, but I will share here that I’m glad Clay had so many people I didn’t know who cared for him. I’ve missed you both so much since you guys moved away, wondered whether you both had enough good people these last few years. I’m grateful to see so many here who have written to Clay and to you all along, throughout this sad and difficult time, and so many there who came to be with him. Much love to you, the girls, and always for our Clay. I will miss him very much, but I am glad he is home now and at peace, beyond all pain. Praying for Clay’s family friends. It is a blessing that he was able to be surrounded by those close to him, to see him through these challenging last months and his passing. Prayers for Clay from my end as well – now, I am doubly glad I made it out to see him before the New Year. please hold onto the St. Christopher medal I gave him, it’s the one with the Air Force seal on the back. Clay was incredibly moved by your visits to him and by your gift of the Saint Christopher medal that had seen you through such dangers overseas. Now it has seen him through his own last difficult trial. I made sure I kept it safe. With your permission I will not bury it with his mortal remains, but will either return it to you, which I would particularly like to do if you are being posted back overseas; or will wait for an opportunity to pass it along, myself, to someone who faces perilous travel or trials and difficulties, made more venerable by its service to you and to Clay. Thanks, and all the best – Clay had my personal email, and if you have access to that I can send you mailing address. O Lord, receive the soul of Your servant, Clay, who has departed from this earthly place to repose in Your Bosom; lead his soul to rest in a place of light, happiness, and peace, where there is neither pain nor suffering, neither grief nor sighing, but only life everlasting. And, as You are a gracious God and the Lover of Mankind, forgive him every sin he has committed by thought, or word, or deed, for there is not a man who lives and does not sin, for You alone are without sin and You are the Resurrection and the Life. when I pray for him. and if you’re violently opposed to facebook, you do not have to join facebook to get to it! Oh, Xopher. That’s wonderful. Bless that man. He is amazing. Yesterday, I read about where the interment is taking place, and I got to look at pictures. It’s beautiful country. So peaceful. I am thinking of you and of Clay this morning, Chris. I am visiting in my heart. Sorry to hear of his passing. I know him ony from Right Wing nation, ands more recently from his blog here. I did not even know his name, except for knowing him as The Right Wing Professor, until I read his name in the comments above. Yet, he will be missed dearly, even by those of us who met him only in the virtual world of the Internet. May he rest in the peace that he was not allowed during his final time here on earth. He is in my thoughts and prayers. I know that the service is happening even as I type. I have never been to a service like this one, so I read about it, and it sounds deeply moving. What I appreciated most is the elements that remind those who mourn that death is not victorious. May Christ whom Clay so loves and who so loves Clay bless and keep you, Christopher, and all of us who stand with you in our sadness and in our hope. I’m sorry I could not make it out there for the service. I will be thinking of Clay all day. The service was beautiful and moving to me and to the family members who were able to be there. That choir is missing a bass, though, observed Xopher wistfully. Wyatt, it was far more important that you were able to see him before he became too ill to talk with you. Thank you for posting about Clay’s passing where one of his other clans and constituencies could hear about it. Clay’s son & I have paused tonight at Charleston en route to the burial site. As news ripples out mong the many communities that shared one interest or another with the Professor, my email queue brings news and condolence greetings from many points along his path through life, and mine. One of my own first cousins writes that she was received into the Orthodox faith in 2007. I had no idea. Xopher – Thank you and have a safe trip to West Virginia. Know that I will never forget Clay, nor will anyone else who was lucky enough to meet him. I’m thinking of you all day, as Clay is laid to rest in a place I hope is even more lovely than its pictures. Please give Nathan my condolences as well. Holy Cross is an English-speaking monastic foundation of the Russian Church Abroad, so they keep the old calendar. By their count Clay fell asleep in the Lord during the season of the Nativity. Clay’s son Nathan and I were present at this last service, which was con-celebrated by Father John Reeves, his pastor from Holy Trinity in State College; Father Alexander Atty, Clay’s pastor from St. Michael’s in Louisville; and Father Seraphim, the Abbot of Holy Cross; Deacon Alexander Cadman assisting. The presence of these dear friends, among whom I now count the gently hospitable community at the Hermitage, was of immense comfort to Nathan and to me. Clay’s resting place is on a stony outcrop of the mountains, looking out over Wayne County, West Virginia. It is a stark landscape in Winter, that will bloom with laurel in the Spring. By what a skeptic might call coincidence, Wayne County is the ancestral home of his mother’s distant ancestors and kin. The homes and businesses of the area are full of Clays and Copleys, all distant cousins of Clay Bond and his brothers, nephews, nieces and son, in one degree or another. Clay’s nearest neighbor in that place of silent rest was a teacher named Dismas, who suffered the torment of progressive paralysis in his own last illness. Perpetual light, tended by the community, stands vigil over their repose until the End and victory come. May their memory be eternal, as God extends His mercy to both the living and the dead. 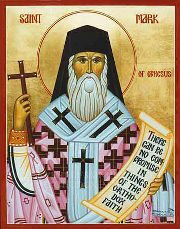 Today, Jan. 19, is celebrated as the feast of Clay’s patron saint, Mark of Ephesus. The saint died on June 23,1444, but his feast is generally commemorated on the anniversary of the day when his relics were translated from St George’s monastery of Mangana in Constantinople (on the Asian side, I believe) across the river to the monastery of Lazarus in Pera. Though it’s only 32 minutes long, it gives a picture of the life of the community there and a generous view of the stark yet beautiful mountainside in West Virginia where Clay rests, filmed in all weathers and every season. Snows and wildflowers, deer and goats, the trees and the misty horizon, it’s all there, beautifully made. 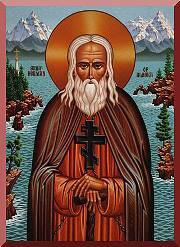 Most of the narration is by the Abbot, Father Seraphim, who con-celebrated the graveside service for Clay. I watched Clay’s copy tonight, and was moved and comforted by it. You can see his grave site in several shots, just in front of the two graves that were in place when the filming was done.